AgeWell Global | Live Well, AgeWell! AgeWell is dedicated to supporting people as they age to improve well-being, and build communities for the elderly. AgeWell Global is a new model of elder care coordination combining peer-based social engagement and mobile technology to improve health outcomes and drive down medical costs. 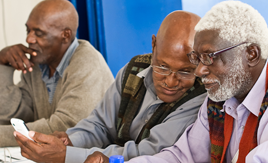 Social Engagement: we employ able older persons – AgeWells – to visit less able seniors in their homes to reduce isolation. Health Screening: using smartphones, and our proprietary 20/20 screening tool (20 questions and 20 observations), AgeWells are trained to collect critical information on clinical, social, and environmental issues during weekly or biweekly visits. Referrals: our integrated mobile technology and algorithms convert screening tool responses into action items that promote good health and trigger referrals to clinical and social service providers. Cost Savings: AgeWell referrals avert high cost interventions, such as hospitalizations, readmissions, premature admittance to institutions, and unnecessary Emergency Room utilization.